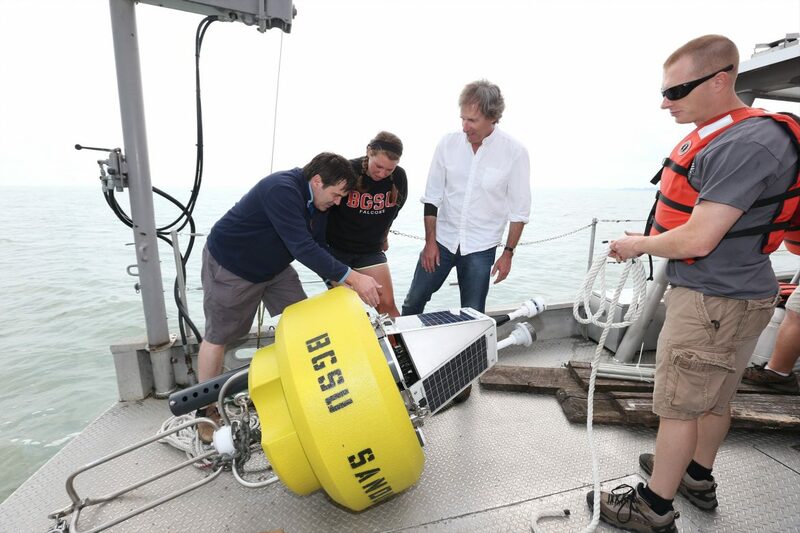 Mike McKay and George Bullerjahn, the new director of the Lake Erie Center for Fresh Waters and Human Health, review data from buoy on Lake Erie. Bowling Green State University recently announced a $5.2 million federal grant to create the Lake Erie Center for Fresh Waters and Human Health. The effort hosted at the Ohio university, around 20 miles south of Toledo, is in collaboration with nine other universities and research institutions. It will continue to research harmful algal blooms, a phenomenon that in 2014 left Toledo without water for several days. The grant from the National Institute of Environmental Health Sciences and the National Science Foundation will make sure researchers can continue their work and develop new projects, said George Bullerjahn, the center’s newly appointed director. Half of that money will stay at the center, but the other half will go to collaborating institutions and outreach programs. Bullerjahn will lead the project at Bowling Green, which examines the environmental conditions that promote the success of the harmful bacteria, he said. He has been studying the good bacteria in algal blooms for over 30 years, but after the water crisis in Toledo, the state encouraged researchers to turn their effort to the harmful bacteria that caused the contamination. When fertilizers from farms and lawns run off into the rivers, they feed the algae and increase the chance of contaminating the algal bloom, Bullerjahn said. Not all algal blooms are harmful, but the ones that are threaten people and pets with disease, destroy to aquatic ecosystems and cause economic devastation. The center now has the capability to begin looking at a bloom’s genetics, he said. “We can do some very precise measurements to try and figure out when the toxic gene is turned on so we can perhaps predict as to when a bloom becomes particularly nasty,” he said. By the time the center applies for the grant again in five years, researchers there hope to have identified different ways that blooms form as well as different strategies for limiting bloom contamination. They also want to identify best practices for detecting the blooms and informing the public about where they are and how bad they might be, he said. Climate change enables these harmful algal blooms to thrive. As water temperatures increase, bacteria grows, he said. “We have to understand more about when they’re made, how they accumulate and what the risks are to human health,” he said. I hope these guys don’t get baffled by all the Malarkey being spread. the only thing that is going to stop the algae outbreaks is to start back up the natural conveyor. have them Google Joe Barrett ice boom nd get a head start on their studies. Gamers with an environmental interest have until Friday to order a special edition of a new board game designed around helping endangered species.